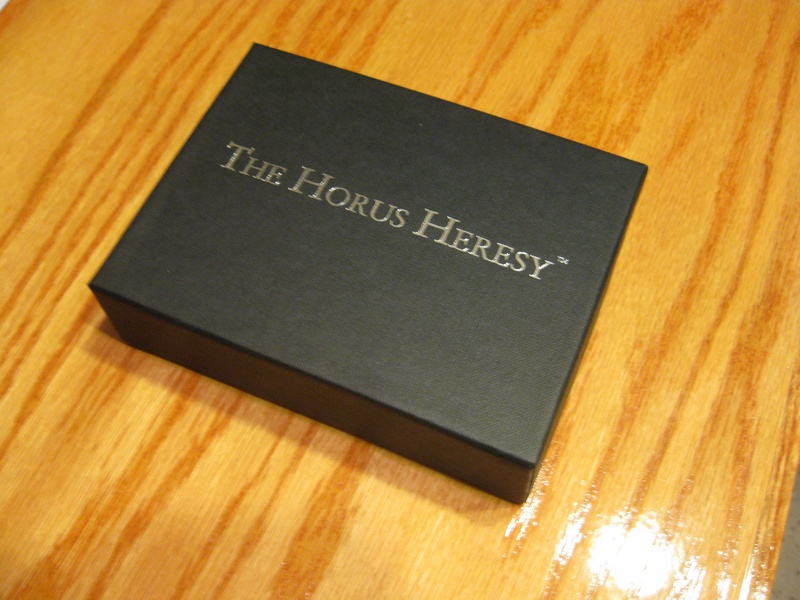 After waiting only a few weeks, The Horus Heresy and Angron model that my brother order has arrived, and things look great so far. To begin with, the rule book very nicely put together: hard bond, metal cover corners, silver leaf page edge, and full colored have paper pages. Now we are just now getting into looking at the rules. Almost half the book is devoted to fluff, and the other half is rules. The rules include complete campaign and mission rules, a complete army list for a Space Marine legion, which includes a mind-boggling amount of war gear and options. Of course, the army list is for any of the legions. Legion specific rules are located after the army list, and gives special rules, weapons, units, and characters for each legion. 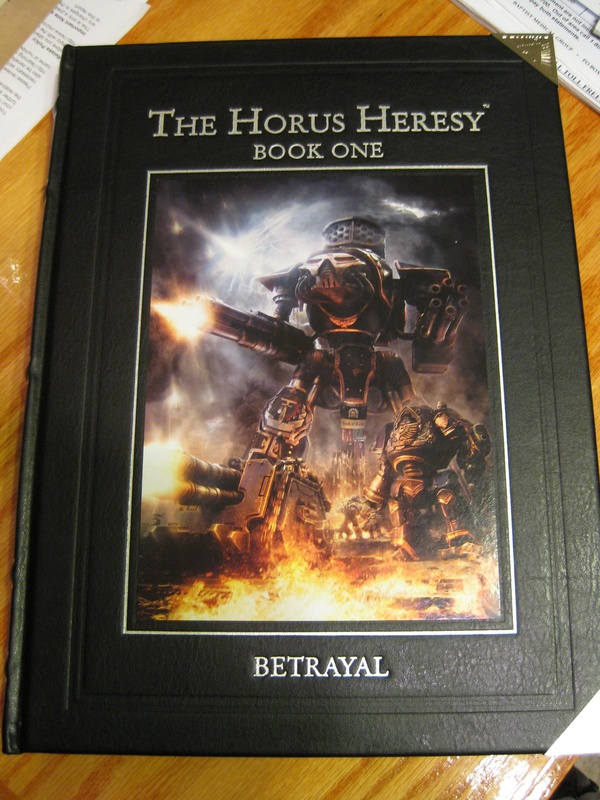 Book one includes the Sons of Horus, World Eaters, Emperer’s Children, and Death Guard. Our initial assessment of the book is that this thing is a beast. It is basically a completely different game, and there is a lot to take in and go over. It will take some times of reading over this and play testing before we can say with any sense of certainty what is good and what is bad. I have to say that this is the nicest package I’ve seen for what is basically a little plastic army man. However, I have some more revealing and interesting shots for those that are interested. 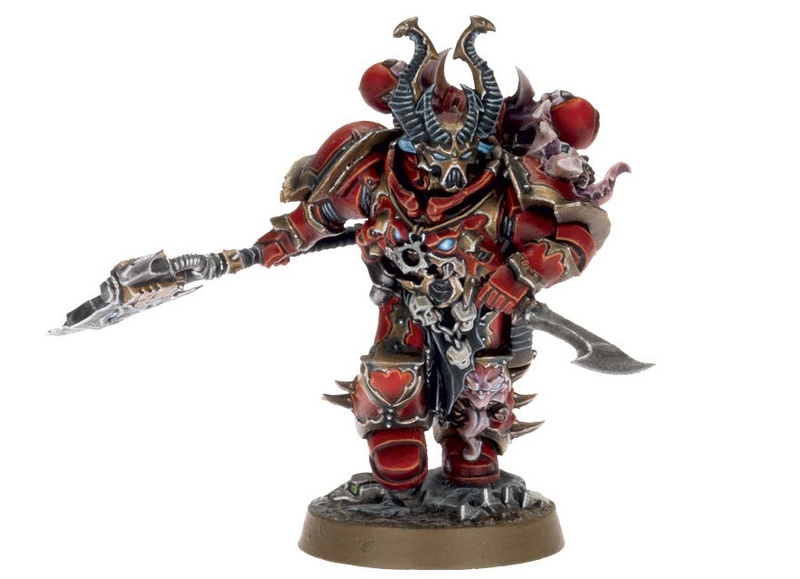 Even with the Chaos Marine’s horns and Angron’s pose it’s still clear that he is definitely taller than your standard marine, which is in keeping with the fluff. Besides the cleaning challenge that’s ahead, the detail is awesome and is leaving deciding whether or not I want to paint all my Primarchs or if I want them paint by one of the many miniature painting services that are out there. As always, if you have any question or comments leave them below. With the recent increase over the weekend of all things Chaos, I decided that I’d take a break on building a painting my Fortress of Redemption and paint up a test model of a Death Guard marine. I’ve always said that if I ever did a Chaos army; I would do Death Guard. There’s just something cool about zombie space marines. 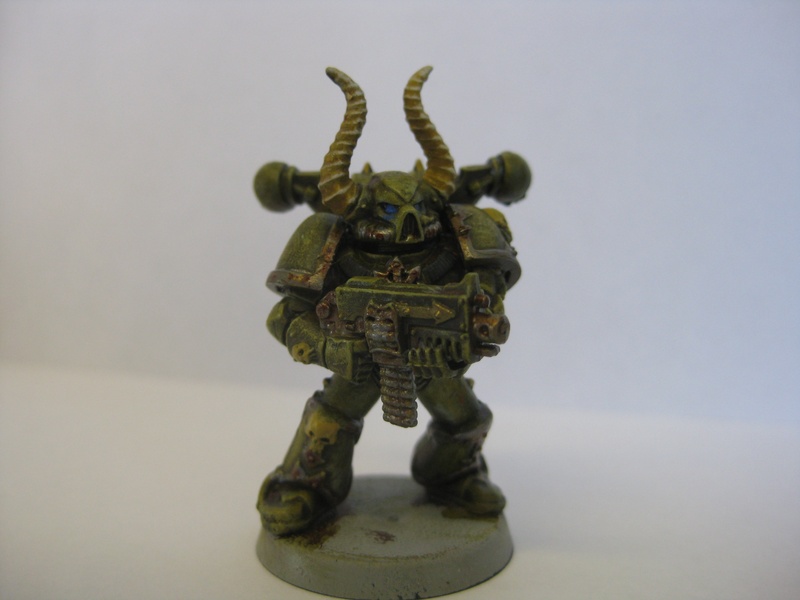 I also did this test model to get things in order, and to have some idea on how to paint Death Guard when I got around to painting my Dark Vengeance starter box. 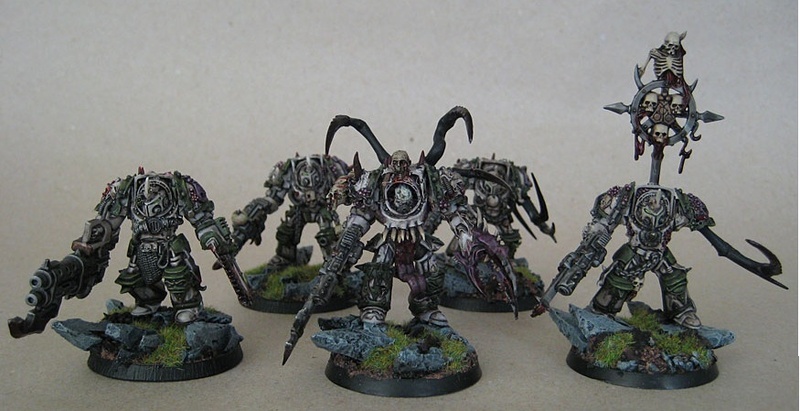 I will admit that I do like this color scheme, but I just feel that over the centuries exposed to the warp and rot of Nurgle the original color of the Death Guard armor would have sluffed off or been caked with all manner of disgusting material. That’s why I went with a more brown/yellow, green armor color. Personally I think the model turned out very good. I’m only disappointed in the fact that I didn’t have the paints to make bright almost glowing blue eye lens, and that I don’t have good lighting to make the picture turn out better. I believe that using Boltgun Metal for all the trim and metal bits works great, and keeps with fluff that Death Guard was not an army known for having their armor bedazzled with bling. 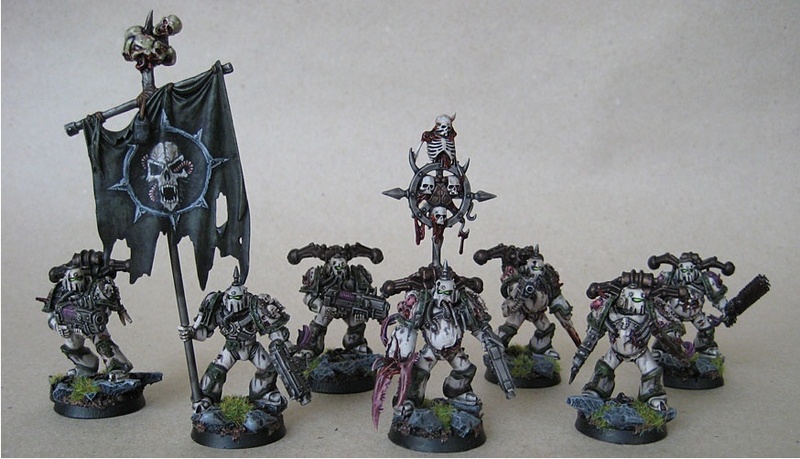 If I were to do a Death Guard Chaos army, I would probably not use a lot of the Chaos Space Marines bits as I feel they are too ornate. 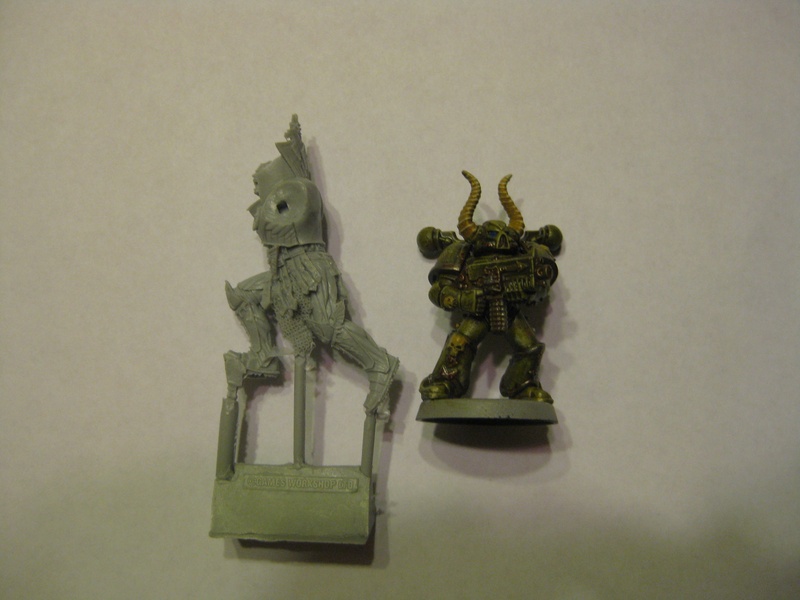 I would instead use the Forgeworld Death Guard conversion kit along with the Mk III Iron Armor set with a smattering of Chaos Space Marine arms legs to construct my army. I certainly love to know what you think about the paint job and color scheme that I went with. My next challenge is to figure out how to do sick decaying flesh and rotten cloth. Feel free to leave any questions, comments, or suggestions, and I will post a tutorial soon on how I painted my test model. It’s been a busy weekend for Games-Workshop and Forgeworld. Both have released previews of the new models that they will be releasing. Now, I don’t play Chaos Space marines, but I’ve always said that if I did, I would probably play Death Guard. In my opinion the new models that Games-Workshop is releasing are very nice. 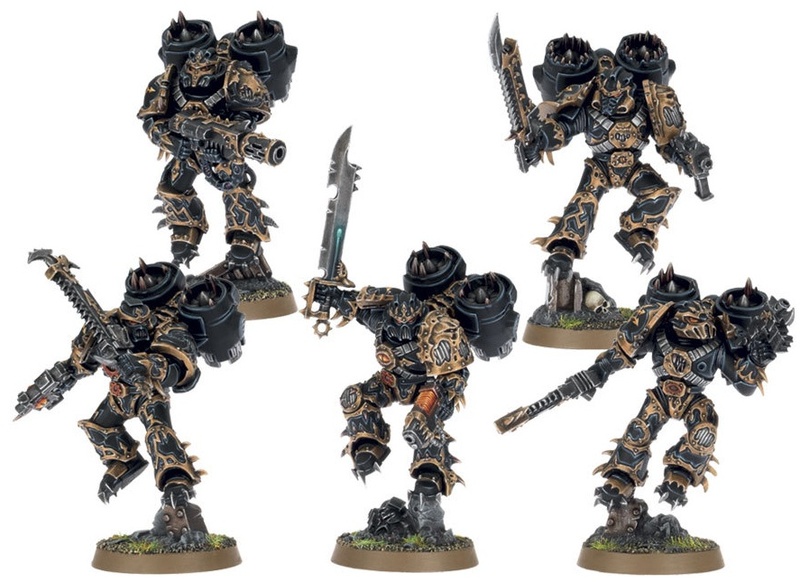 The new Chaos Space marines don’t look like regular space marines with spikes. It’s also nice to see Games-Workshop making more dynamic model poses as well as making the models resemble some of the art work. I’m very happy with the new figures, and depending on how the codex is done I may even dabble with a small Chaos Marine army. There are some problems with the new release of Chaos Marines. The first are the Daemon Engines. While these units are very interesting and probably would be fun to build and paint. They’re just not my cup of tea. 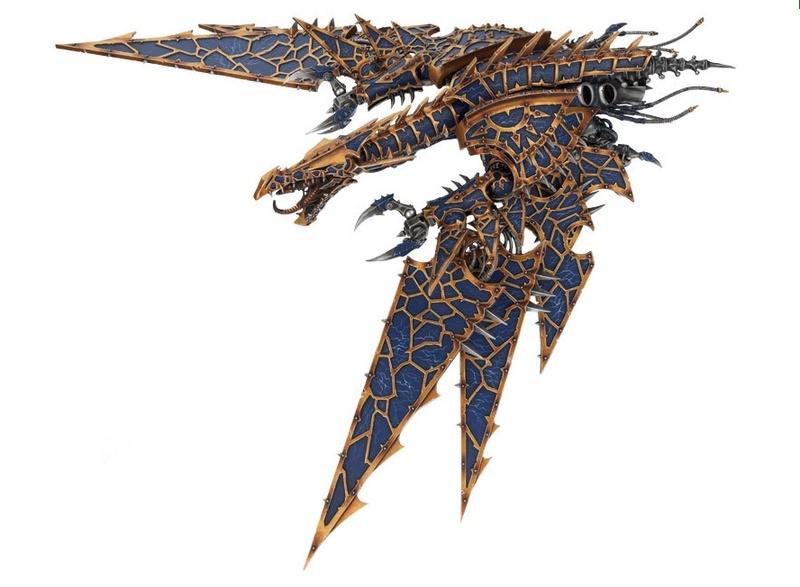 I have no criticism about the models I just think Chaos Marine tech would be regular marine tech but warped by chaos. They’re design, lines, and aesthetics are completely different from what is generally accepted as Space Marine aesthetics. However, the most disappointing thing about the upcoming Chaos Marine release is the repackage of many of the older models into Finecast. When compared to the new models that are being released, this sadly just makes to older models look more dated and bland. As I expected from Forgeworld, this is a very nice model, and I’m already tempted to started a collection of the Primarchs as they come out. My only concern, and that’s only because I can tell by the video or pictures, is the size of the model. 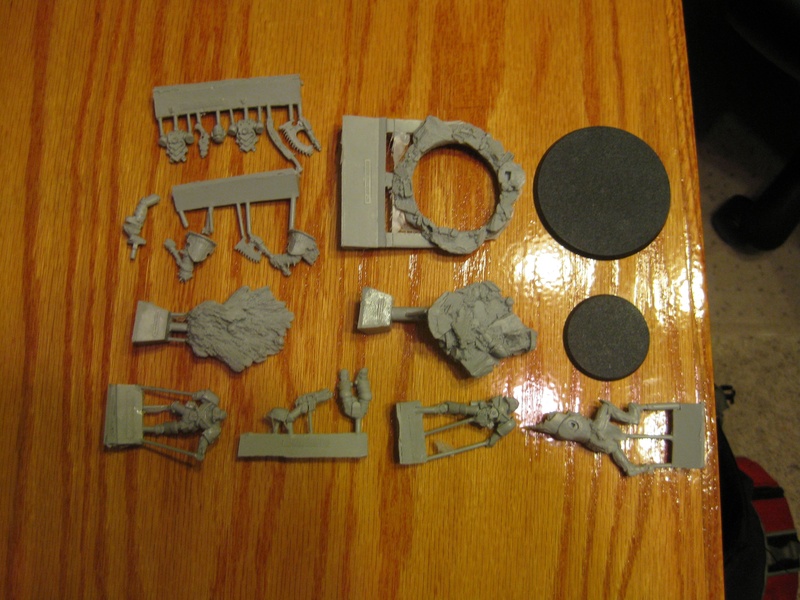 The impression I have as of now is that the model appears to be a bit small for what a Primarch should be. 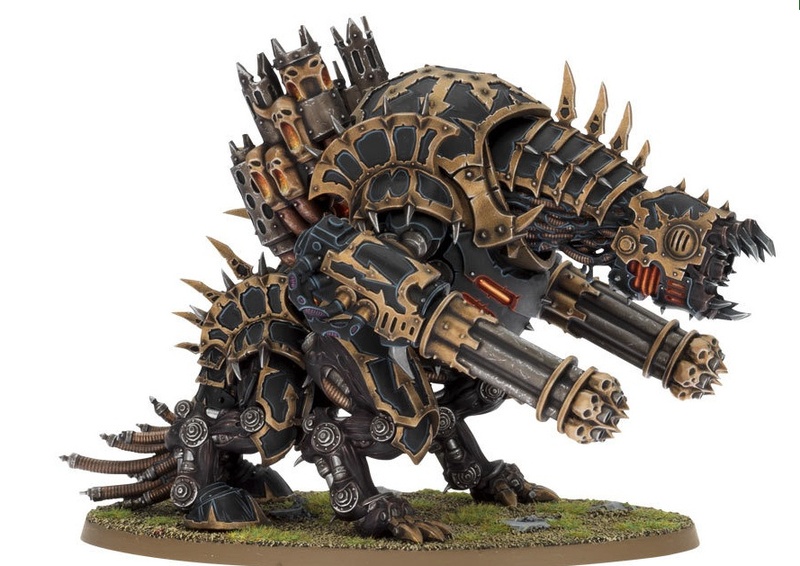 Let me know what thoughts are in the comments about the New Chaos Space Marine models and Angron model.